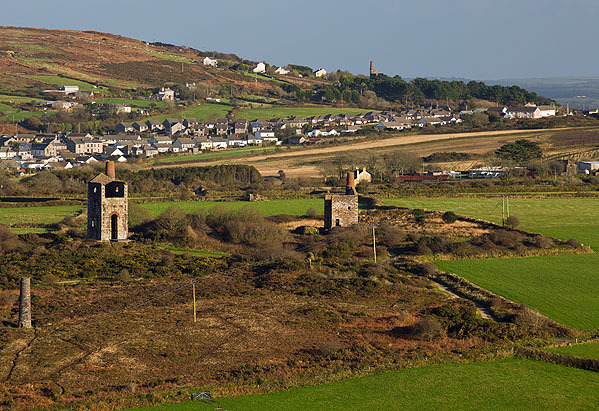 Wheal Uny is located on the eastern slopes of Carn Brea - the northern edge of the Great Flat Lode. On the left the Engine House (1869-70) for a 70-in Pumping Engine. On the right the Whim Engine House (1880) for a 26-in rotative, for the Hind's Shaft. The mine was operating intermittently from 1800 , mining copper then later tin from the Great Flat Lode , closing finally in 1893. Cornish Tin found in streams was first used in prehistoric times for the production of Bronze. Britain became known as the 'Tin Islands'. Cornish Granite contains high amounts of Tin , Tungsten and Copper in cocentrated lodes. In the C16 miners moved underground to seek out the source Lodes. Pre 1870 Cornwall was the Worlds leading producer of Tin. Copper mining developed in C18 and in the 1830's Cornwall dominated world copper production. The steam driven beam engine , housed in the famous Cornwall Engine Houses allowed groundwater that could flood the mines to be removed and at the height of the Mining Industry there were more than 600 steam engines working in Cornwall. Around 3,000 Engine houses were built , with 200 still surviving.